The day after the result of Indonesia's presidential election was announced, I joined crowds of excited Indonesians at the Proclamation Monument in central Jakarta to celebrate president-elect Jokowi's election as Indonesia's seventh president. Did you see the rainbow? asked a supporter, pointing to a blurry photo on his mobile phone as Jokowi arrived to address the crowd and break the Muslim fast with them. I hadn't, but even if the heavens had opened and soaked everybody to the skin, it would have been taken as another sign that God too had voted for Jokowi. The monument commemorates the proclamation of Indonesia's independence from the Dutch made by Sukarno and Hatta in 1945. Their statues looked down on Jokowi as he proclaimed what many believe and hope is a new era in Indonesia, including its liberation from the twitching hand of Suharto's New Order. Many Indonesian commentators feel Prabowo's bid to have the result reversed in his favour by the Constitutional Court and threats to haul the Election Commission before the Parliament are no more than the New Order's death rattles. In his speech Jokowi did not rubbish Prabowo though he was entitled to given the dirty tactics employed against him and Prabowo's petulant claim on BBC that Jokowi was a fraud whose much lauded closeness to the people was fabricated for political purposes. The personal attack fell flat. I asked my taxi driver and a street vendor what they thought of the comment. Both said how proud they were that a wong cilik or little person like them could achieve the highest office in the country. It gave them hope, not just in Indonesia, but in themselves. In fact, Jokowi did not even mention Prabowo in his speech. It was as though Prabowo and what he stood for was no longer relevant. To avoid candidates of this kind running in future elections, the respected commentator Wimar Witoelar has proposed that aspirants for high office should receive endorsements from both Indonesia's respected Commission for Human Rights and its crusading Corruption Eradication Commission. It is to be hoped that a Jokowi administration will act on this proposal. It would enhance the quality of candidates, spare Indonesia considerable embarrassment and help eliminate impunity. The president-elect focused his comments on the contribution to his election made by volunteers, that is, civil society. His campaign achieved an unprecedented level of citizen participation that included millions of small donations from ordinary Indonesians and jealous monitoring of the count. This represents a substantial shift in Indonesia's political culture, the significance of which can only be appreciated by comparison with the Suharto era when the people were treated like children not citizens. Politics in Indonesia is no longer the exclusive domain of party machines, the elite and wealthy, or slick campaign advisers hired from the US. Jokowi made this point eloquently. Speaking from the deck of a magnificent traditional schooner late at night after the result was announced on 22 July, he surprised many by saying, 'There is happiness and goodness in politics ... it represents freedom.' He went on to applaud the sense of responsibility and optimism that 'has blossomed in the souls of the new generation' and the rebirth of the Indonesian tradition of 'voluntarism'. Jokowi has urged everybody to go back to work. His legions of supporters, however, are not about to vacate the scene and leave it all to him. His fans will hold him accountable. 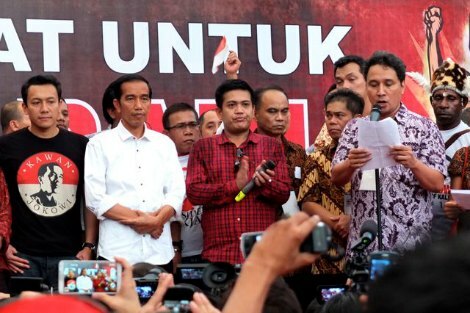 Before he spoke at the Proclamation Monument, a respected civil society leader, standing near the president-elect, read out a long list of the promises Jokowi had made during the campaign. The list included addressing past human rights violations. Behind him, conspicuous by his dark skin and indigenous headdress, stood a proud Papuan, a silent reminder to Jokowi of his campaign commitment to Papua and that it should no longer be off-limits to international journalists and human rights organisations. Jokowi promised a revolusi mental or paradigm shift in Indonesia. He is no revolutionary but a significant shift has clearly occurred and can be confidently expected to continue. Whether those around him like Megawati, the Wanandi brothers and ex-military Wiranto and Hendropriyono will allow the new paradigm to include the past, including crimes in Timor-Leste, will test both Jokowi and Indonesia's civil society to the maximum. Pat Walsh is currently visiting Jakarta. He co-founded Inside Indonesia magazine. Photo by Pat Walsh: President-elect Jokowi (white shirt) meets his volunteers at Proclamation Monument in Jakarta, 24 July 2014. Recent articles by Pat Walsh. As always Pat Walsh writes with such poignancy and weight about the hopes and challenges for Indonesia as it embarks on an important next stage. Terima kasih, Pat! And from me also, Pat; thanks for sharing your experience of the celebration of Jokowi's election victory. I do hope that during Jokowi's term(s) as President, the majority of Australians manage to update their awareness of Indonesia as a fully-fledged functioning democracy. For too long, surveys have found that many, even most, Australians still see Indonesia through a New Order glass darkly. Yes, thanks, Pat. The happiness you experienced amongst the crowd accords with what most of my co-workers felt. It is indeed a new broom. He has a big job ahead of him but if anyone can change the mindset of nepotism and subservience that have characterised Indonesian politics since Independence (and before), it is him. His crowd-sourcing way of determining his cabinet is surely a sign that he is serious about what democracy actually means. Pat Walsh is one of the most insightful writers on Indonesian affairs.What a pity I cannot think of one Australian journalist/commentator who writes so perceptibly about Indonesia. Well done, Eureka Street, for publishing his work. If any world leader - and Jokowi if he can find a body of men and women to help him implement his reform program, his revolusi mental, will be a world leader - deserves and needs our prayers it is Jokowi. He will be good for the Indonesian people of all faiths (I'm thinking not only of the Muslim majority but also of the Buddhist, Hindu and Christian minorities). From a selfish point of view he will be good for Australia because I think we could do with a revolusi mental. East Timor and West Papua could become test cases. Thank you, Pat. It is a great day for Indonesia. Jokowi may well be heaven sent: I certainly could not envisage someone like him succeeding a few years ago. Indonesians may not see coming to terms with their past as primarily a collective act of "repentance" as Paul Collins envisages, partly because the vast majority of them are not Christian. They are Muslim, albeit that tradition is different from what pertains in the Middle East. It is, traditionally, especially on Java, a tolerant tradition. Most of them had no part in the dark deeds of 1965/6; East Timor or Papua because the Old Order was about disempowering anyone who was not a member of the elite. The Javanese tradition, they being the most populous ethnic group, is traditionally one of deference to the authorities. Very similar in many ways to the old Irish-Australian Catholic tradition. As with Catholics in this country, Indonesians seem to be breaking free of the authoritarian mould. The people I first got to know Indonesia from were very much supporters of the Old Order. Their point of view would be in the minority now but Jokowi needs to be careful. He is a good man but not naive. Hopefully he will change things. Most positive article I've read about Indonesia. I hope it all works out. May justice be done to the Papuans, and their story be told and accepted. Jokowi’s win deserves to be celebrated and recognised as an extraordinary advance in the maturing of Indonesian democracy. But we should not let this enthusiasm mask some nasty realities. While Jokowi and his supporters have been openly rejoicing during the Idul Fitri celebrations, Prabowo has been quiet since lodging an appeal to the Constitutional Court claiming “massive and systematic fraud”. He also alleged that Jokowi had cheated. You don’t need to understand Indonesian – just the body language says Prabowo will not give up. He may be delusional, even a psychopath as some suggest, but he remains explosively dangerous. I fear too many are projecting their personal agendas on Jokowi and expecting him to fulfil their needs. He seems to be an honest and likeable man but he is a lousy orator – something his supporters conveniently overlook. If Jokowi asserts his independence while he still has the people’s mandate and can face down the huge pressures he’ll encounter from the establishment, the army and the extremist Muslims he may succeed. But if he falters the New Order dinosaurs will surely rip him to shreds because his victory threatens them all. If that happens, then farewell democracy in Indonesia. Well done Pat,I now know a lot more about Indonesia than I did before and I'm happy to see that the good guy is running the show now. As an Arab-Australian it's difficult to watch the events in Syria, Iraq and Gaza without a sense of guilt and shame. To outside eyes, it must appear that the Middle East is driven by hatred and bloodlust. In fact there is a long history of persecuted members of one Middle Eastern faith finding safety in the places of worship of those that are often cast as their enemies. This is the Middle East, at once unconscionably cruel and unbearably kind. The shooting down of MH17 by insurgent anti-aircraft missiles has now been swallowed up in the wider drama of the fierce civil war raging in Ukraine's pro-Russian eastern region. On 24 July, the International Committee of the Red Cross proclaimed Ukraine to be in a state of civil war, appealing to all those involved to respect the humanitarian rules of war or face later indictment as war criminals. The burning question now is, what will Putin's Russia do?